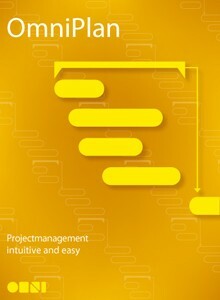 Product information "OmniPlan 3 Pro, update (download): 2 -> 3 Pro"
OmniPlan is a program designed to help you create logical, manageable project planning documents. With OmniPlan you can break down tasks, optimize the resources needed for your project, control costs, and monitor your entire project at a glance. OmniPlan provides features like Gantt charts, schedules, summaries, milestones, and critical path highlighting to let you manage all your activities. From customizable views to fast data entry, OmniPlan helps you manage complex projects without requiring you to learn a complex software program. Mac OS X 10.10, Mac OS X 10.11- The current version of OmniPlan 3 requires at least Mac OS X 10.10. Related links to "OmniPlan 3 Pro, update (download): 2 -> 3 Pro"